An increasing number of people like using their Android cell phone to take photos in these years due to the convenience to carry around. However, the storage of a cell phone is limited, so when there is no more space, you may want to release some. But before you do this, you may want to make some backups. Then how to transfer photos from Android to computer as backup? How to import them from your computer to your Android cell phone? Have you had any obstacles to do it? Don't be worried about it. After reading this article, you will find it quite easy to copy or transfer the photos from your phone to computer and import them to your cell phone. Step 1. Use a USB cable to link your phone to computer. 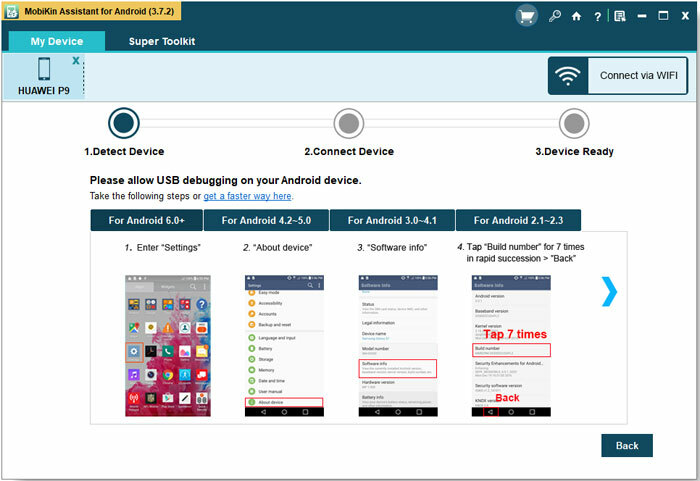 During the connection, you need to enable USB debugging on your phone to make the device be detected. Step 2. After the detection, you can double click on the icon of This Computer on your PC and then find out your phone. Step 3. Now you can double click on your device to open it and then click on the folder named DCIM. Step 4. In this folder, you will see the Camera folder and you should double click on it. Then you see all the images that you have saved on your phone. Step 5. Now if you want to move the photos from Android phone to computer, you can select the wanted files in the Camera folder and right click to choose Copy option and paste them into your computer. 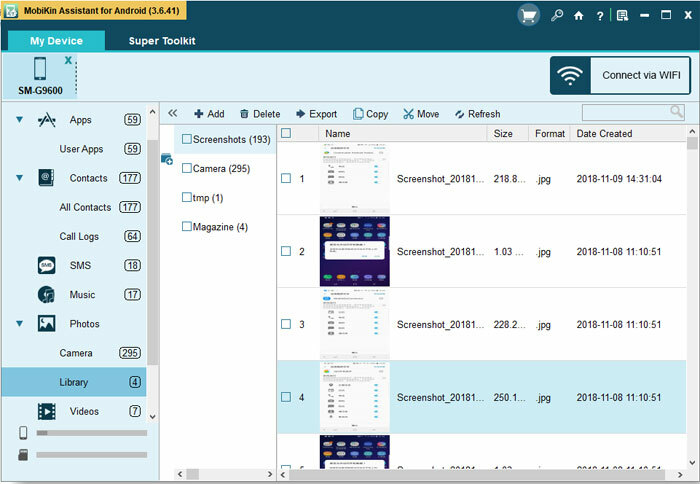 But if you want to sync the images from computer to the mobile phone, you can choose and copy the files from your computer and then paste them to the Camera folder. Step 1. Open Google Drive on your Android phone and then login to your Google account. Step 2. After entering the service, you need to click on the "+" icon and then choose Upload from the listed options. Step 3. Now you will see a list of files are displayed on the interface. You can elect Images or Gallery from the list to view the photos on your phone. Step 4. Next, you can tick the pictures that you want to transfer and tap on Done to start the moving process. Step 1. Go to website of Google Drive on your computer and sign in your Google account. Step 2.Then you need to open or create a folder on your Google Drive. Step 3. Now you can open the folder that contains the pictures you want to move and then drag them into the Google Drive folder. That's it! Now your photos on computer/Android phone are all uploaded to Google Drive and you can download them to your Android phone/computer to view and use them freely. Now you can download a free trial version to try first and start to transfer your photos between your Android cell phone and computer. There are two different versions, and you can choose the right one that matches you PC system. I will show you how to use the Windows version, and for Mac users, the steps are similar. Let's begin. Step 1. First of all, connect your Android phone to your PC via USB cable and then run the program. If you have installed the USB driver before, the software can recognize your phone quickly. If you didn't finish this, you may have to follow the steps to install the USB driver first before you move on. - For Android OS 4.2 or later, enter Setting-> Developer Options, (If you did not find the Developer Options, go to About Device, and tap "Build number" 7 times in rapid succession then back to the Setting page, and then you will find it. ), turn on Developer Options->USB Debugging. When it's done, tick USB Debugging Opened and click Next shown on the interface below. 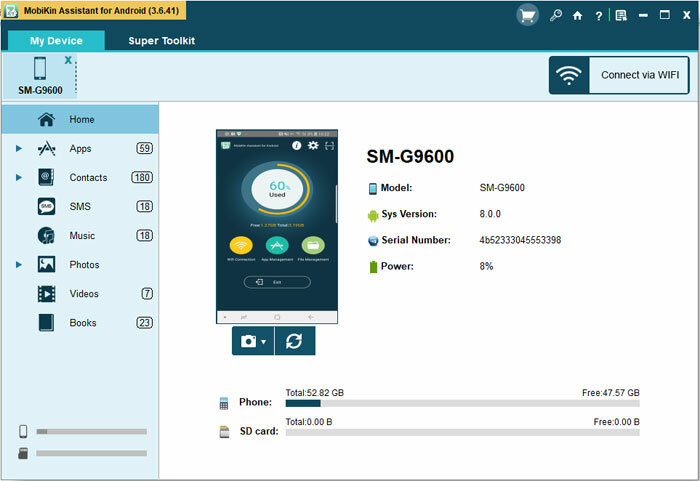 Then you will see the detailed parameter of your Android phone such as model, system version, power and storage displayed in the popped up window like this. Step 2. Click the category Photo on top of the window and you will see the brief information on the left panel. Then click Phone Gallery to preview the photos stored on your Android phone. Tick what you want to transfer and hit Export to copy these photos to your computer. Besides, you can also drag some photos from your PC to your Android photo by clicking Add. Congratulations! Now you have successfully managed to transfer photos between your Android cell phone and computer. It's not as difficult as you thought it would be, right? In addition to photos, other files like contacts, books, videos and apps can also be transferred freely within several clicks. So get this photo sync software to manage your Android phone systematically.